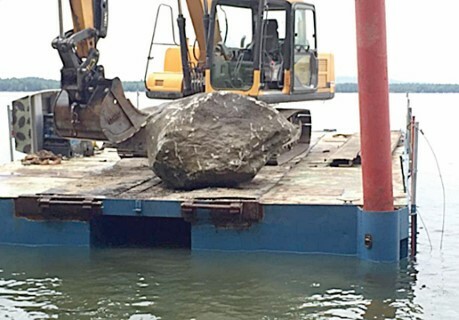 moving rocks, working in the water and protecting the environment. 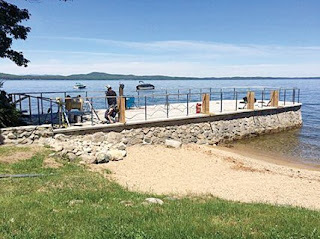 Big Lake Marine Construction co-owners and partners Robbie Durant from Durant Excavating and Jim Winn of Sebago Dock and their teammate Al Brousseau, the general manager for Sebago Dock and Lift can do any type of construction in and around the water. They also do island transport and delivery service on Sebago Lake and to a smaller extent on other lakes in the area. “We sell happiness. People who want our products can afford us. We do a lot of different things from moving stones to reclaiming a beach,” said Winn. When Brousseau goes to a property for a consultation, he considers what can be done at the property and tries to match that with what the property owner has in mind. “If they ask for big, elaborate concrete piers and moving all the rocks on the waterfront,” said Brousseau. It can’t always happen, but more times than not they can satisfy their needs. Winn has been in the area working on the water for 30 years in different capacities. He and his team know the lakes and how to make the waterfront better for all to enjoy. The company works on concrete piers, boathouse repairs and rebuilds, excavating on islands or moving rocks on the shore. After a consultation to make sure what the customer wants is doable, the permits are applied for and then work can begin. Big Lake Marine walks the customer through all of that paperwork, making it easier and can do the work professionally and quickly. Big Lake Marine has a small barge and a 32-foot boat customized for delivering supplies and items to a job site. The barge can travel to Brandy Pond and Long Lake as well. Eighty percent of their customers are summer property owners from outside of Maine. They also consider themselves waterfront welding specialists and can fix a dock while in the water. The most popular thing customers do is add or fix stone piers with concrete tops. His favorite project thus far has been a stone pier with a concrete top and stainless steel handrails. The company does beach reclamation where the sand from the water is pumped out and back up onto the beach. They can also make access easier from the beach into the water so that homeowners don’t have to scale the rocks to so swimming, Winn said. Additionally, they do salvage work for boats and personal watercrafts that have broken away and might have ended up on rocks or sunk. Each winter the ice moves the rocks as it freezes and thaws. “They are constantly moving around,” said Brousseau. They work with private home owners and associations as well as some of the marinas on the lake. 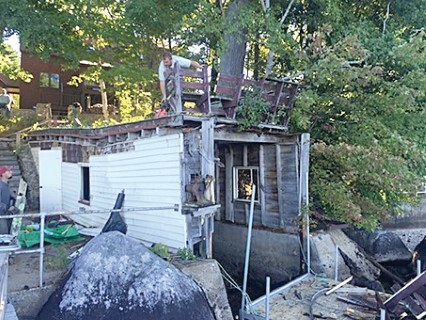 In the fall Sebago Lake is dropped four or five feet and many times the people who live there can’t use their boat past September because their dock isn’t long enough. “With DEP permission we can extend the boating season,” said Brousseau. 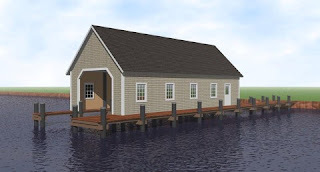 Big Lake Marine Construction can also build timber structures on the land for homeowners. The most difficult part of the job is “Permitting,” said Brousseau. “And, finding the solution for the problem a customer wants to do,” Winn added. “We’re trying to make a positive impact on the lake and please our customers,” said Brousseau. For more information, visit www.BigLakeMarine.com, call 207-595-8679, email info@biglakemarine.com, or visit them on Facebook.